Born in Northern Ontario, Canada, Fr. Peter Joseph Towsley grew up in a devout Catholic home with four brothers and two sisters. In addition, his parents lost two children through miscarriage, giving him, from a very early age, a strong sensitivity to the sacredness of each new life and a deeper understanding of eternal life from the moment of conception. After graduating from St. Anne’s Grammar School and Iroquois Falls Secondary High School, he attended the University of Waterloo and received a degree in Philosophy. He first sensed God was calling him to the priesthood at a Vocations Retreat in 1982. Having heard of a year-long spiritual formation and discernment program at Madonna House in Combermere, Ontario, he spent his time there working, praying, studying and living in Community to test and discern his call. Inspired by Mother Teresa of Calcutta, Fr. Joseph Langford’s book I Thirst led Fr. Peter to join the Missionary of Charity Fathers in New York and attend St. Joseph’s Seminary at Dunwoodie in Yonkers. He received his degree in Biblical Studies from Holy Apostles Seminary in Cromwell, Connecticut. He was ordained for the Diocese of Bridgeport as a Transitional Deacon in 1990 and to the Priesthood in 1991. Since then he has served as parochial vicar to the parishes of St. Jude in Monroe, Holy Family in Fairfield, St. Rose of Lima in Newtown and St. Marguerite Bourgeoys in Brookfield. 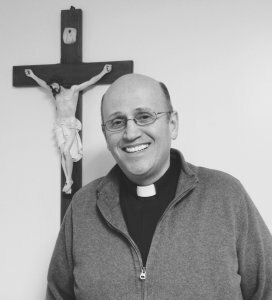 He served as Pastor of St. Ann in Bridgeport for seven years and was installed as Pastor of Sacred Heart of Jesus in Danbury in April of 2015. Fr. Peter has always had a great love for Family Life and has sought to support and sustain families from the very beginning of his priesthood. With the support of his Diocese, he coordinated five abundantly blessed two-day East Coast Family Conferences and a Theology of the Body Conference. He has established vibrant Youth Groups in all the parishes in which he has served, and is currently Spiritual Director for the newly formed Steubenville New York Summer Youth Conference. He has attended many World Youth Days and World Meetings of Families throughout the world. In addition to his other duties, Bishop Frank Caggiano has appointed Fr. Peter as Vicar for Evangelization for the Diocese of Bridgeport and Episcopal Delegate to all the Ecclesial Movements in the Diocese. He has worked in High School Ministry and has been part of the Diaconate Formation Program for many years. He is also Spiritual Director for Paradisus Dei, a nationwide organization with a variety of programs to help families discover the superabundance of God within marriage and family life.